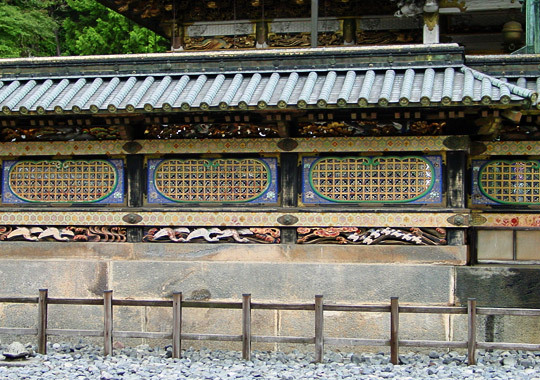 A fence or wall classified according to the materials used to make it: board fence *itabei 板塀, an earthen fence faced with tiles or one with rows of inserted tiles, kawarabei 瓦塀; stone fence, ishibei 石塀; clay or mud and plaster fence *dobei 土塀 or *tsuiji 築地; tile and clay fence *neribei 練塀; and many kinds of fences made with bamboo or brush. The names of fences may be derived from the shape and/ or place they are used. For example: vertical cedar bark boards secured by thin, horizontal, bamboo battens *yamatobei 大和塀; horizontal, notched weatherboarding into which vertical bamboo strips are inserted, sasarakobei 簓子塀; a fence that has a comb-shaped inserts, *kushigatabei 櫛形塀. Fences may also be called *kaki 垣. Other type of fence include: the see-through fence sukashibei 透塀, the *genjibei 源氏塀, the picket-board fence *saku-itabei 柵板塀.